AUSTIN, TX (Sept. 21, 2015) – Chip Ganassi Racing with Felix Sabates (CGRFS) with drivers Scott Pruett and Joey Hand won overall in the Lone Star Le Mans at Circuit of the Americas in Austin, Texas. Pruett qualified the No. 01 Ford EcoBoost Riley on the pole, earning Ford’s second pole of the 2015 season. Pruett gained a five-second lead on the field shortly into the 2 hour, 40 minute race. He defended his lead on a four-wide start, pulling out to a 1-second lead before the first caution of the day would fly. Pruett kept the No. 01 on track during the caution and after the restart put a 3.5-second lead on the field before making the first pit stop of the day for four tires, fuel and a driver change. After leading the first 26 laps of the race, Hand brought the No. 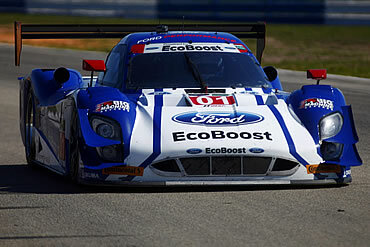 01 Ford EcoBoost out of the pits in the sixth position. Shortly after taking the wheel, Hand clocked the best lap of the race with a 1:58.752, just 0.3-seconds off co-driver Pruett’s qualifying pace. With 1-hour, 18-minutes remaining in the race, Hand cycled back to the lead as the leaders made green-flag pit stops. Hand was leading the race when the second full-course caution of the day flew and would dominate the restart to defend his lead. Hand brought the No. 01 in for his first and last pit stop with just over 40 minutes remaining to take on four tires and fuel. Late in the race Hand bettered his own best lap of the race with 1:58.616. Hand had worked up an 8-second lead with 20 minutes remaining in the race and would go on to win his second race with CGRFS and the team’s second consecutive Lone Star Le Mans with a 16.9-second margin of victory. The next TUDOR United SportsCar Championship race for CGRFS will be the Petit Le mans at Road Atlanta on October 3.